Lady and the Blog → Living → Featured → What She Wore Wednesday: Loving The Fall Weather! What She Wore Wednesday: Loving The Fall Weather! It’s time for military jackets and vests people!! I’m so excited about it too. Layering is a girl’s best friend. Especially ME – someone who needs to hide some extra cushion around da middle. I wore a great piece from Rachel Roy today – tried to find it online for a good 45 minutes and was unsuccessful. Truthfully, I bought it MONTHS AGO when the weather was MUCH WARMER. It retailed for $89. The version I’m showing below is so much cheaper and has the same feel. 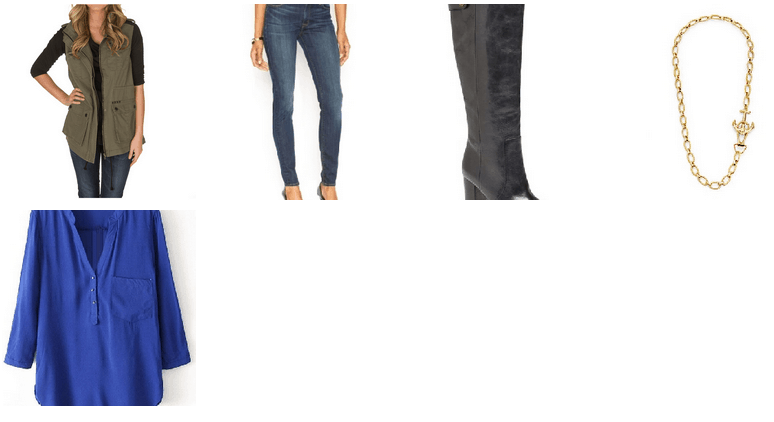 Hope you like the fashion find I put together!! Click on the below image to take a look at all the pieces. Mix and match what you need to get the same feel and style. Previous Post: « ENTER TO WIN: Admission for Five to Morey’s Piers First Boardwalk Bunk-Down and Camp Under the Wildwood Stars! Love the military look forever and a vest is just right for warmer Fall days! !